Ferrara, City of the Renaissance, and its Po Delta are the first example of Italian Renaissance town planning and its influence on the landscape. In 1492, the plan of the city was redesigned on the order of the ruling Ercole d'Este I. Biagio Rossetti designed the new lay-out, introduced new streets linking the Renaissance city with the medieval heart and adding fortifications. Ercole d'Este I was one of the most significant patrons of the arts in late 15th and early 16th century Italy. 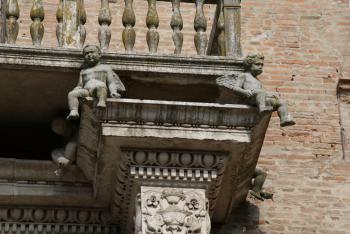 Ferrara at that time grew into a cultural center, renowned for music as well as for visual arts. Ferrara is situated 50 km north-northeast of Bologna, on the Po di Volano, a branch channel of the main stream of the Po River. The associated sites in the Po Delta include (among others): Este ducal residences in Diamantina, Voghiera and Schifanoia, the Villa della Mensa and the towns of Cento and Comacchio. Ferrara has a certain charm and calmness, but I found it not up to par with great Italian cities like Verona, let alone Venice or Rome. The Michelin Green Guide gives it 2 stars (“worth a detour”), and that is about right. 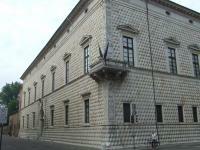 I stayed there for 2 nights, using it as a base for a day trip to Mantua also. The various sights are scattered around the city center, showing the town’s various stages of development which are so crucial in its OUV of “Renaissance town plannig”. To the east lie several small palaces, built by wealthy relatives and supporters of the ruling d’Este family. The Palazzina Marfisa d'Este for example is a villa with a garden that could be lovely if well-attended to (I was visiting in winter so maybe it is nicer in spring or summer). There’s a loggia at the back, and the house’s interior has many decorated ceilings and period (or later) furniture. The nearby Casa di Romei is bigger, has two stories and houses a small museum. At the heart of the city are the Cathedral and the Castle. Both have striking exteriors. In the interior of the Cathedral dark grey colours stand out – I was not too impressed with it. The Castle’s interior is quite barren too, but is surely worth visiting. At the lower levels the history of the city and the d’Este family is told via displays, and in another part the frescoed ceilings are shown up-and-close via mirrors on the ground. There are some particularly gloomy dungeons too. North of here starts the Renaissance extension of the town, with straight streets and monumental houses. The famous Palazzo dei Diamanti lies here. By then it had started to rain, so after a few quick photos I cut my visit short. Ferrara is certainly one of the most livable cities in Italy, being the country's bicycle capital and having many green spaces. Its historic centre is quite interesting and pleasant, as well, but to me it did not appeal so much as a WH city. The cathedral and the Castello Estense, the city's landmark, are not bad (especially the moat), but nothing outstanding. I also saw the Palazzo dei Diamanti, famous for its unique wall, and the Palazzo Schifanoia, with its beautiful frescoes. To see the Po Delta part of the inscription, I took a bus out to Comacchio, a pleasant little town with a pretty Old Town and direct access to the canals and waterways that make up the delta. I just saw a small part of it, but I do believe that the Po Delta, as a unique cultural landscape, would easily stand on its own as a separate WH site, as I can't really see a very close connection to Ferrara (except for geographical reasons). Maybe then Ferrara should have been combined with Mantova as a pair of Renaissance towns. Finally I have succeeded in finding my way into the Po Delta area. I took a FER train from Ferrara to Codigoro to see the flood protection structures in the district. I then took a bus to Commacchio, a picturesque town on the edge of its namesake lagoon. The lagoon is very popular with fishermen, but the town has a network of canals and bridges and a collection of restored medieval buildings. A veritable mini-Venice. A combined bus/train journey brought me back to Ferrara. I visited this WHS in September 2012. 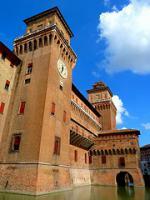 The highlight of this medieval city is the Castello Estense. The visit inside is very informative and you get to see the dungeons where prisoners used to be kept. The mirrors are a great way to help illustrate the painted ceilings. The Cathedral and Palazzo dei Diamanti as well as Piazza Trieste are worth visiting too. Ferrara is one of my favourite cities in northern Italy, although its buildings and churches are less outstanding compared to other cities such as Verona and Vicenza. The plan of the city and most of the historic buildings date from the 14th and 15th Century, when Ferrara was ruled by the Este family. 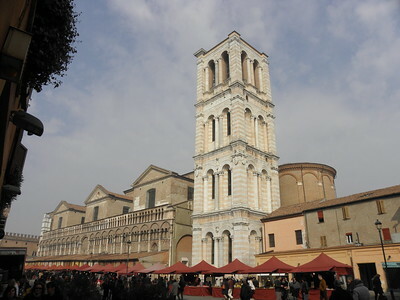 The historic centre is dominated by the Castello Estense and the Gothic cathedral. The Castello has everything you'd expect from a medieval castle: drawbridges, a moat, towers, a dungeon. But the upper parts were reconstructed in the 16th Century, the battlements were replaced with terraces and balconies. Worth seeing are also the Palazzo dei Diamanti with its exceptional facade of pyramid-shaped blocks of marble (the interior picture gallery is not very interesting), the nearby Palazzo Prosperi with an portico decorated with putti (photo), the Palazzina Marfina d'Este, the Casa Romei, the Palazzo Schifanoia (wonderful frescoes in the Sala dei Mesi), the Via delle Volte, the outside staircase of the Palazzo Municipale, and the Cimitero della Certosa. We liked best to ride by bike on the city wall that surrounds the whole historic centre and so we explored also the remote parts of the old city. Ferrara is known as a city of cyclists and bicycles are available in most hotels. Ferrara is a university town, and therefore has also a good night-life. If the weather is fine a trip to the Po Delta is worthwhile, especially if you like birdwatching. The best is to rent a bicycle and cycle along the marshlands and lagoons. The WHS includes also several Delizie (villas of the Este family) in the area around Ferrara. But they are hardly worth a visit, most of them can be seen only from the outside or are not accessible at all. The WHS site includes several buildings from different periods. The Castello Estense and the Palazzo Municipale are from the medieval period, while the Palazzi Diamante, Guido d'Este and Turchi-di Bagno are typical buildings of the renaissance period. Buses #1&9 link the station with the Castello Estense and the Parco Pareschi. Spent a pleasant midday strolling around the Renaissance city of Ferrara. Really enjoyed the unusual cathedral (pictured) and the frescoes of the Palazzo Schifanoia. Most striking, however, is the city-planning: from the winding alleyways of the medieval old town to the grid-like streets of the Renaissance-era Herculanean Addition. Throw in some fantastic parks and impressive architecture and Ferrara makes a wonderful day trip for those in the Emilia-Romagna region. I stayed in Ferrara for eight months as part of my BA Italian degreee and I really enjoyed it. The city was great, there are a lot of things to see. There are many places, but the best are the Palazzo Diamanti and the smaller Palazzo Marfisa d'Este. Other places of cultural interest are the two cathedrals- the gothic facade of San Giorgio is amazing, whilst the Castle is a reminder of the Este family who ruled Ferrara in the 15th century. There are many parks to rest and enjoy the sunny weather, such as the wonderful Parco Massari, or the Piazza Ariostea where there is an annual racing event, the Palio, that dates back to the mediavel time. Not only is Ferrara steeped in history, but it is close to many of the northern cities. Venice is only an hour away by Eurostar, whilst Padua, Mantua and Verona are easily within two hours. Florence is only under two hours away as well! There are clubs and bars too, making Ferrara's night life good! There is always a restaurant or pizzeria around the city, offering good value for money. 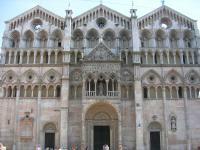 Overall Ferrara is a great place to visit, or use as a stopping point to move onto somewhere else! 4.0: Caspar Dechmann Antonio J. From "City of Ferrara" to "Ferrara, City of the Renaissance and its Po Delta"
Equestrian Statues: At the square in front of the cathedral, there's a statue of Niccolo III d'Este seated on a horse. Musical Notation: Pomposa Abbey is where Guido d'Arezzo invented the staff notation. Nicolaus Copernicus: Received his doctorate in canon law (1503). Cultural landscape not recognized: 1999 extension in AB ev described as cultural landscape - crit v of the inscription even says "The Po Delta is an outstanding planned cultural landscape"